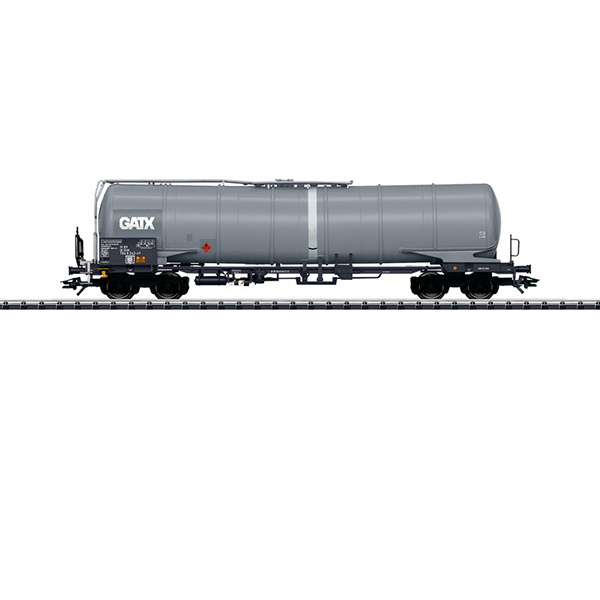 Prototype: Type Zans four-axle, 95 cubic meter / 25,096 gallon tank car with an uninsulated tank, a ladder on the end, and a funnel flow tank. Privately owned car for KVG Austria with advertising for "GATX", used on ZSSK, registered in Slovakia. The car looks as it did in 2010. Model: The car's trucks are the modern type welded Y25 Lsd1 with double brake shoes. The car has a brakeman's platform and a ladder on the end. The brake rigging, discharge pipes, dome cover, safety bars, and numerous other levers and grab irons are separately applied. The car has rectangular buffers, 6 tank bands, and large address boards. Length over the buffers approximately 19.6 cm / 7-3/4". AC wheelset E700150. This model can be found with another car number in an AC version in the Märklin H0 assortment under item number 47542.